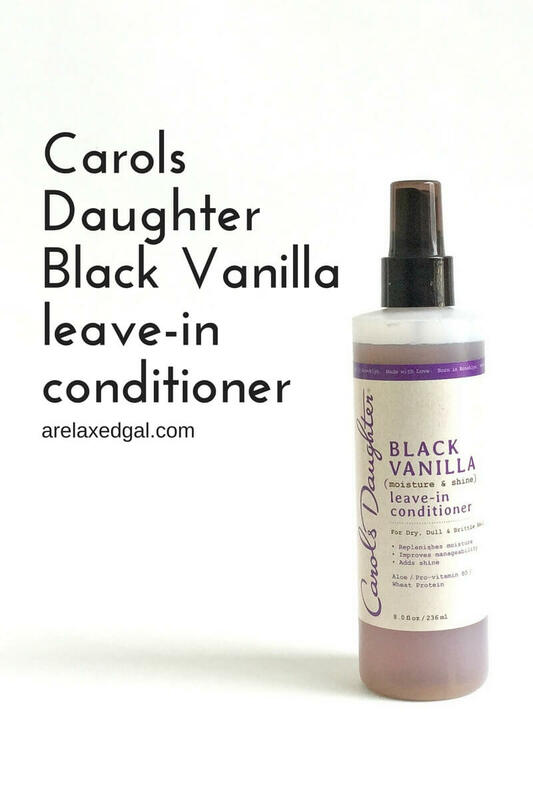 I purchased and tried a new leave-in conditioner Carols Daughter Black Vanilla Moisture & Shine Leave-in Conditioner which I mentioned in my 10 Weeks Post 7/11 Relaxer Touch Up post. I usually try to use a product three or more times before forming an opinion, but now that I'm more familiar with what my hair likes and doesn't like I don't always need that long to decide if I should toss it or keep it. See whether the Carols Daughter Black Vanilla Moisture & Shine Leave-in Conditioner stays or goes in this first impressions video. "Dry, dull, brittle hair can be fixed in an instant so hair can immediately be more manageable and softer with lots of shine. This weightless leave-in conditioner restores natural moisture and adds strength to your hair. The blend of Wheat Protein and Pro-vitamin B5 fortifies your hair so it’s healthier and won’t break when detangling. Made with natural moisturizers instead of synthetic silicones for true hydration that doesn’t rinse away and can be used every day without the fear of weighing-down your hair"
"Hold 6 to 8 inches away from your hair and spray all-over. Use on wet or dry hair to help detangle. Use on dry hair to refresh your style. Do not rinse out." "Water (Aqua), Polysorbate 80, Glycerin, Panthenol ( Pro-vitamin B5), Sodium Hyaluronate, Sodium PCA, Butylene Glycol, Lavandula Angustifolia (Lavender) Flower/Leaf Stem, Lonicera Caprifolium (Honeysuckle) Flower Extract, Lonicera Japonica (Japanese Honeysuckle) Flower Extract, Salvia Officinalis (Sage) Leaf Extract, Calendula Officinalis Flower Extract, Hydrolyzed Wheat Protein, Hydrolyzed Wheat Starch, Hydrolyzed Corn Starch, Potassium Sorbate, Citric Acid, Caramel, Fragrance (Parfum)." Disclosure of Material Connection: The item(s) in this post were purchased with my own funds. I have not received any compensation for writing this post. Nor do I have any material connection to the brands, products, or services that are mentioned.